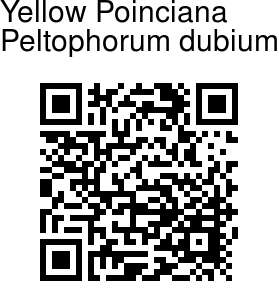 Yellow Poinciana is a tree native to South America. It is commonly confused with the similar looking Copperpod. However, Yellow Poinciana is a prettier bloomer and more graceful tree than Copper Pod. It has a rather slender bole, is high branching, with about 40 to 60 percent of the tree being cleared trunk. Its fine leaflets give it a graceful look, and its umbrella-like shape makes it an useful shade tree. 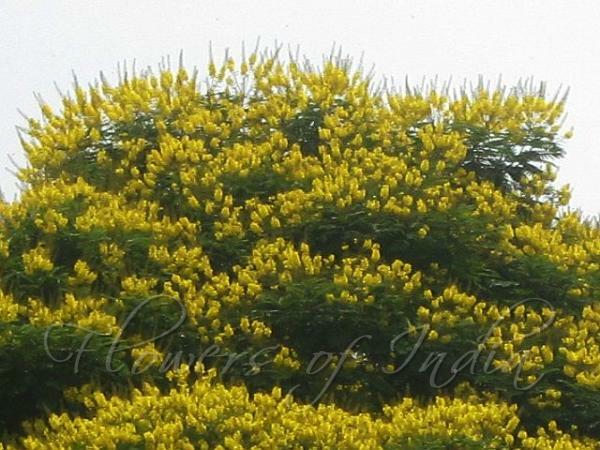 At flowering, the tree is completely covered with bright yellow, upright panicles. Leaves are double-compound, alternate, up to 18 inches long with 12-20 pairs of sidestalks, and 20-30 pairs of leaflets per sidestalk. Flowers are golden yellow, mildly fragrant, with crinkled petals, borne on open terminal panicles. Pods are flat, up to 4 inches long with 1-3 seeds, and do not split open. Yellow Poinciana is a cultivated tree in India.